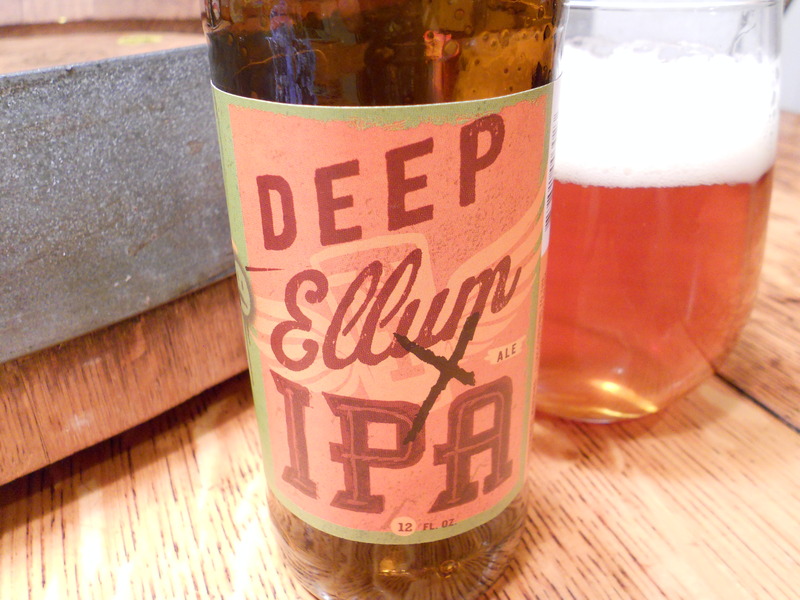 I am quietly (or maybe not so quietly) becoming a big fan of one of Dallas’ newer breweries, Deep Ellum. Their beers get consistent high grades from Tilting Suds, and their IPA is going to continue that hot streak. Deep Ellum has only recently started distribution of their beers in bottles, so I do not know how far beyond Dallas their beers have made it, but they will quickly develop a sterling reputation beyond the borders of this simple blog if they continue making beers as good as this IPA, their flagship beer. Their IPA pours a bright amber, with a strong hop citrus hop aroma. That aroma is complemented by floral hops in the taste, with a nice malt back bone to tie it all together. I do not know what the ABV % is, but there is a bit of an alcohol bite to this beer, which does nothing to detract from the overall flavor profile. Another oustanding beer from Deep Ellum, 7.5/10. I spent a few years out in Denver in the early nineties. I learned to love mexican food, did some mountain biking, honed my appreciation of good beer, and dug through the racks of the used record stores in between going to class. * I cannot say for certain whether I had any Great Divide Beers while I was living there. I sort of recall the name from that time, but the mind plays tricks on you, and memories, especially those centered around and/or fueled by the consumption of alcohol, are unreliable. 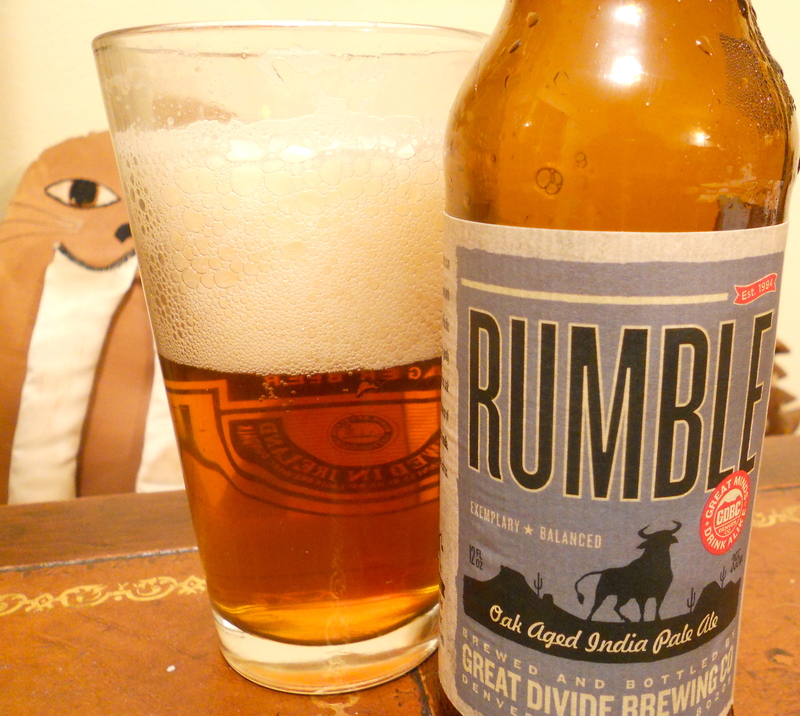 I have certainly had Great Divide Beers in the intervening years, and while I would not put them in the upper echelon of American brewers, they are certainly good enough to take a flyer on when I see something I have not tried before, like the Rumble India Pale Ale. Aged in oak barrels (like all IPAs should be! ), and that aging shows in the subtle vanilla aroma and flavor behind the heavy dose of piney hops and caramel malts, this beer clocks in at 7.1 % ABV. Did I mention there was some sediment floating around in my beer? There was, and I love when my beer has flotsam and jetsam** in it, 7/10. *No, I never went skiing. **As the sediment is neither cargo dumped overboard nor wreckage from a ship, it is technically neither flotsam nor jetsam, but those terms sound better than detritus so I am going to roll with them. The Good, The Better, and The Strange: More Florida Beers! Tequesta Brewing Co. American Farmhouse Ale – Tequesta Brewing Company does not appear to have a website, although they do have a Facebook page and some reviews on Yelp, so they are not wholly ignorant of this thing called the internet. While they may not have much of an internet presence, I can say that they know how to make beer based on the pint of their American Farmhouse Ale that I knocked back recently. This American Saison was delicious. It had the funky farmhouse yeast aroma, pale yellow and cloudy color, and hay like flavors that I associate with saisons. I call it an ‘American’ Saison as it had a nice dose of hops added to it, which to me tasted like Chinook hops from the Pacific Northwest. This was not as hoppy as an IPA, but the hops were a prominent feature of the beer. This was a fine tasting beer, 7.5/10. Cigar City White Oak IPA: I enjoyed Cigar City’s White Oak IPA in a bottle, so I jumped on it when I saw it on tap recently. All the good parts of the bottled beer (the vanilla and oak notes, the complex fruitiness of the hops, the creamy texture) were amplified in the draft version. This beer was simply outstanding, 9/10. Let’s have a brief musical interlude with my favorite Rock and Roll band from Florida, Charlie Pickett and the Eggs! 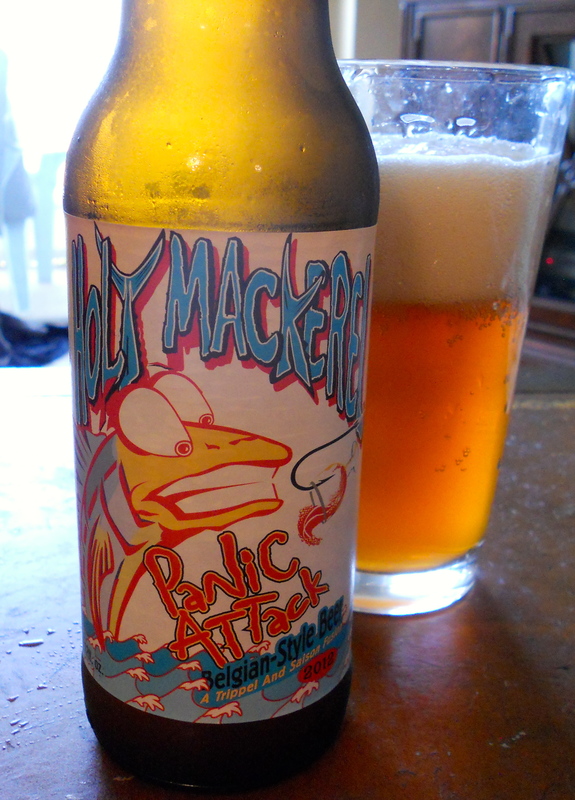 Holy Mackerel Panic Attack: Billed as a Trippel/Saison fusion, this tastes as odd as that sounds. This is overloaded with sweet fruit flavors, canned peaches, pineapples, mangoes. It is treacly sweet without any hop bitterness to offset that sweetness. Rather, this beer relies on the 10% ABV as a counterbalance to that sweetness, and 10% is not nearly alcohol to cut it. You also get that cotton candy bubblegum flavor that I find so cloying in trippels. The only saison notes I could find were in a slight funky yeast aroma and flavor. It also had a strange mustiness to it. I know it sounds like I hated this beer, but I actually found it kind of interesting, although I am not quite sure if I actually liked it, 6.5/10. 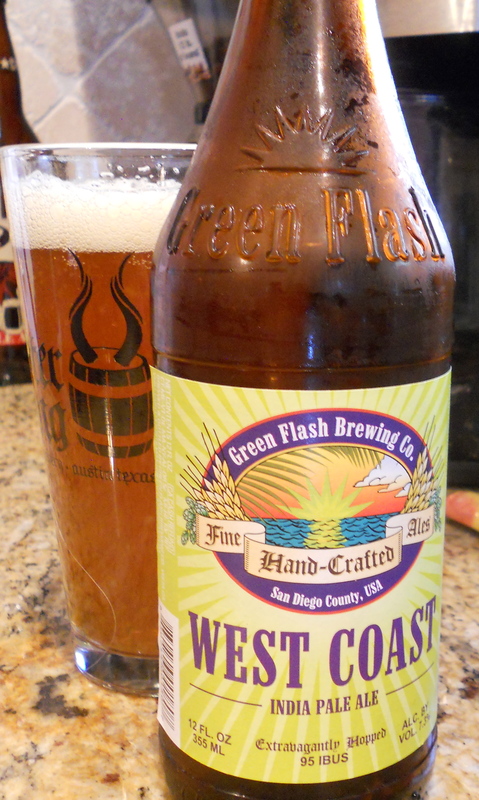 After drinking some lousy beers, I needed to freshen my palate and drink something good, something that set the shite and onions beers in stark relief, something that made me sit up and say “this is why you love beer.” I hit the bullseye with the West Coast India Pale Ale by Green Flash Brewing Co. This pours a deep rich amber with a nice two finger head that is retained to the bottom of the glass. The first thing I noticed in the aroma was the hops, with lots of pine, grapefruit and just a touch of the sticky-icky, with some sweetness from the malts as well. The taste closely tracks the aroma, with a dry and bitter finish. There is a touch of malt sweetness, but this is a hop bomb, as are most west coast IPAs, and the 7.3 % ABV is not even noticeable through all of the hoppy bitterness. My only complaint about this beer is that the texture is a bit thin, but that is a very minor complaint, 7.5/10. Beating the heat in Texas is a fool’s errand. It simply cannot be done. It is like trying to stop Michael Jordan in his prime. That is just not going to happen. But as the sportscasters used to say, “you cannot stop Michael Jordan, you can only hope to contain him” and that is the approach I take to summer in Texas. I concede that I am going to be hot and miserable. There is no way around it, but I am not going to let the summer defeat me. I am going to ride my bike whenever I can, I am just going to be sure to stay well hydrated. I recognize that my car is going to be pizza oven hot when I get into it, I just park in the shade whenever possible and use the window screen religiously. I understand that every pool I jump into is going to feel like plunging into a bowl of warm spit, instead of the cold, bracing, damn near heart attack inducing sensation I am used to after growing up in the northeast. And I know that the heavy IPAs I usually prefer are going to go down like sludge, so I resign myself to drinking lighter bodied beers during the dog days of summer. 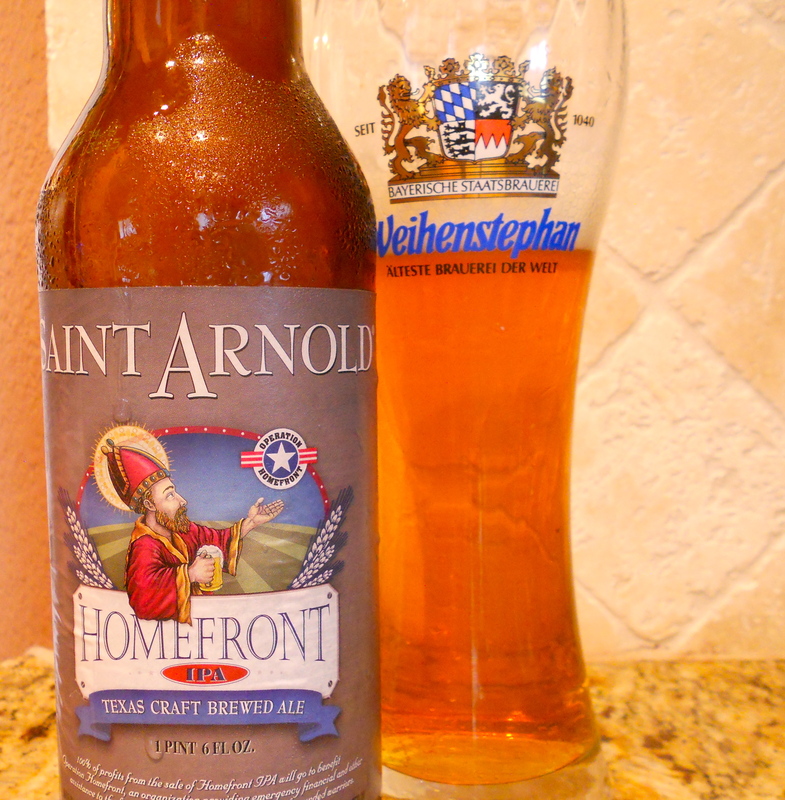 Although I resign myself to drinking lighter beers in the summer, Saint Arnold’s Homefront IPA* is a damn fine india pale ale for the Texas heat due to it’s light body. The aroma is sweet oranges and flowery hops. The taste has the floral hops right up front, with some orange marmalade bittersweetness in the background. The Homefront IPA clocks in at 6.5 % ABV, which is so well hidden that I would have guessed it would have been around 5%. This is another fine addition to Saint Arnold’s lineup of beers, 8/10. *Saint Arnold brewed this in honor of Memorial Day, and Saint Arnold is donating the profits to Operation Homefront, and organization providing emergency financial and other assistance to the families of American service members and wounded warriors. Don’t see much difference between these two bottles, do you? 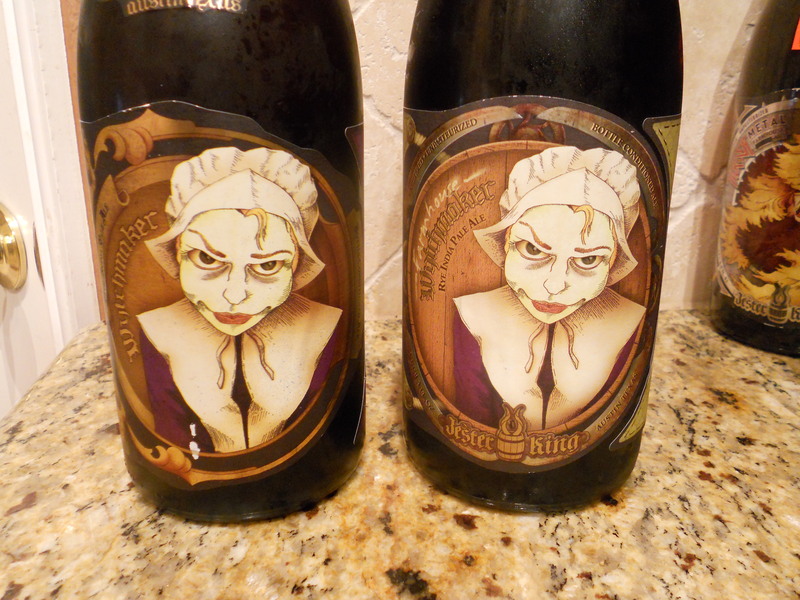 The bottle on the left is the regular Jester King Wytchmaker Rye IPA (my 2011 Beer of the Year!). The bottle on the right is the Wytchmaker Farmhouse Rye IPA. The only difference between the two is the Farmhouse Rye IPA uses farmhouse yeast in place of the regular ale yeast. This gives it a slightly sour and funky flavor. It pours a little cloudier, and the aroma is just a touch funkier, with a touch of sourness added to the flavor. The difference is subtle, but nice. I don’t think it makes it a better beer, and it is not substantially different either, but it is still damn good, 9.5/10. The Farmhouse version is a little cloudier, a little funkier, but just as tasty. BONUS REVIEW! : The Farmhouse Black Metal is an improvement over the already excellent Black Metal Stout. The sourness from the farmhouse yeasts adds another flavor dimension and rounds out the dark chocolate, dried fruit, anise and dark brown sugar flavors. Again, any differences between the two beers is subtle, but liked the farmhouse version a touch more. 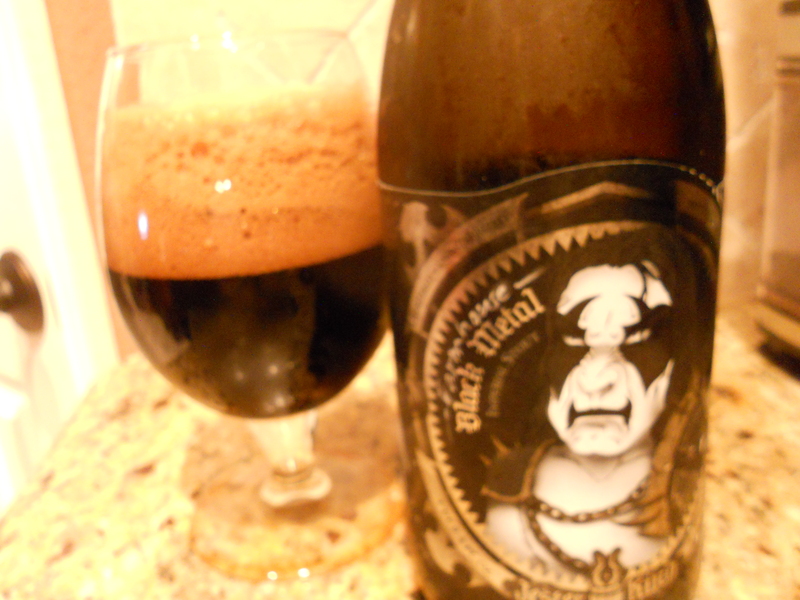 I gave the regular Black Metal Stout a score of 8.5, but the farmhouse version gets a 9/10. You are currently browsing the archives for the Style: IPA category. Venture Snowboards S… on Ska Brewing Co.